If you're looking for a reminder of THAT incredibly heart wrenching scene from Inside Out to display on your desk or office shelf, look no further. 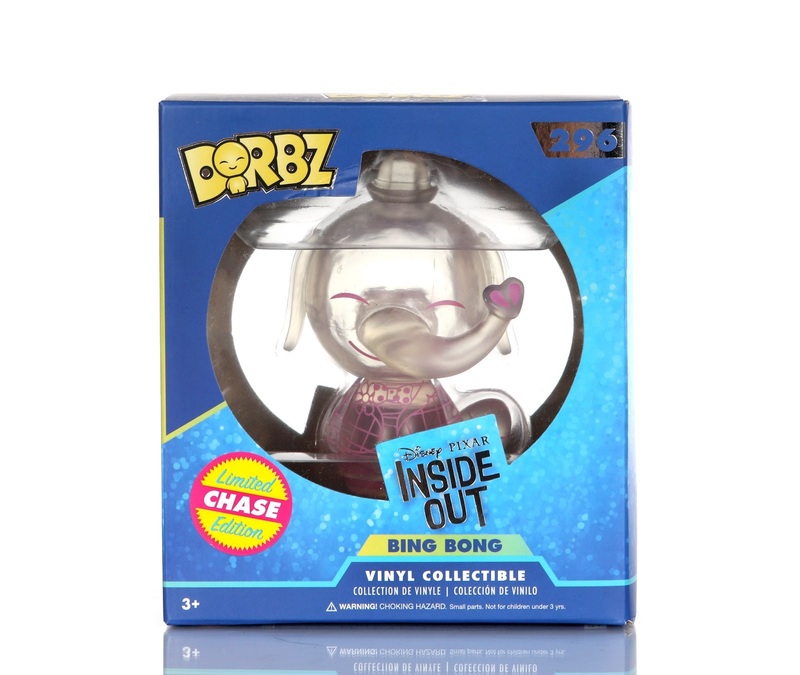 ;) Here we have the clear "Limited CHASE edition" Funko Dorbz Bing Bong vinyl figure—a continuation of the Inside Out Dorbz collection released back in April (check out that original post for an overview of the line)! This Bing Bong Dorbz retains the same sculpt and number as the standard version (#296), but now the character is translucent as if to represent Bing Bong fading away. Funko did a very similar thing with their Hot Topic exclusive clear Bing Bong "POP!" figure from exactly two years ago. Now honestly, I have no idea where this one ever ended up being released at. Over the past couple months I've consistently checked at GameStop, Hot Topic, Toys R Us, Walmart, Target, Barnes & Noble and really wherever Dorbz are sold around me—with no luck. For those of you who found him in stores (not online), where did you end up tracking him down? I understand that he's designated a "limited edition", so I knew he'd be rare, just not this rare. I'm also not sure of how many units exactly he's limited to (LE 1,000? 2,000?). Any info would be great if you have it. I was lucky enough to get this Bing Bong for my birthday from my parents last month, though they did have to pay those eBay prices in order to get him. I'm super grateful they did that for me! eBay prices for this one are currently right in the $20-$30 range. I like how the outlines of his facial features and outfit were kept and in Bing Bong's signature "cotton candy pink" color. He stands at about 3" tall, has one point of articulation (head can rotate a full 360 degrees) and originally retailed for the typical Dorbz price of $7.99. If you're an avid collector of the Disney/Pixar Funko Dorbz figures and/or just a huge fan of Inside Out, this might be one you'll want to track down. I think it's really neat looking, plus as a completest, I needed it to finish up my Inside Out Dorbz collection. At this point, eBay and Amazon are your best bets if you're looking to purchase this; visit Amazon using the link below or eBay using this direct link to current listings. Don't forget to share your thoughts in the comments below or through any of my social media channels!